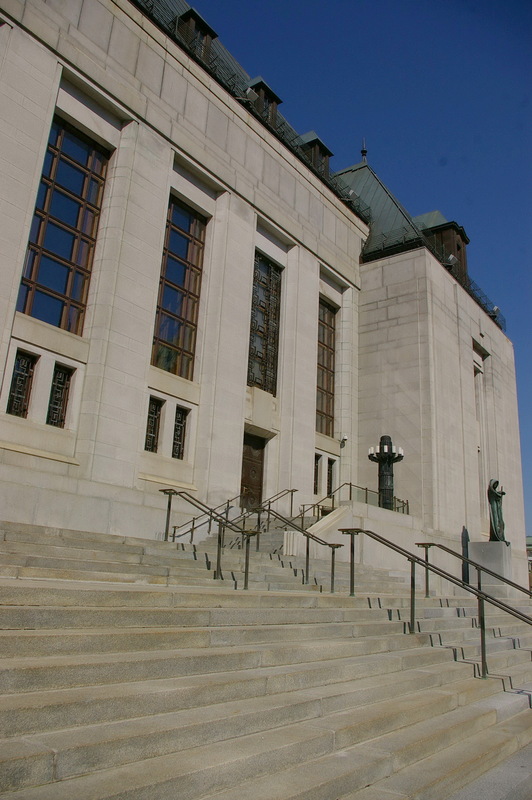 Description: The building faces south and is a four story grey coloured stone and concrete structure. 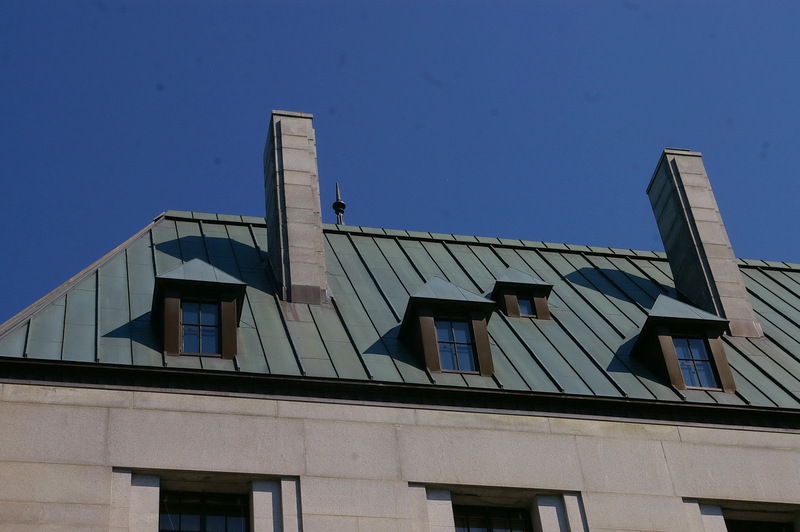 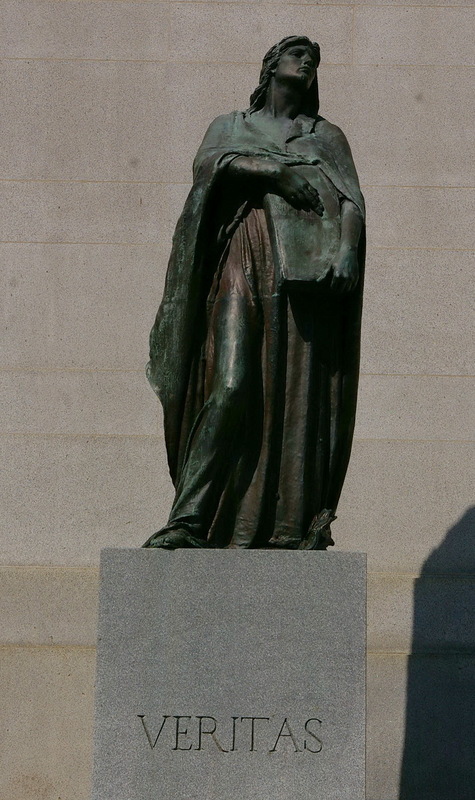 The building is located along the south bank of the Ottawa Rive to the west of the Parliament Building on landscaped grounds in the city centre. The “U” shaped building has a French mansard roof. 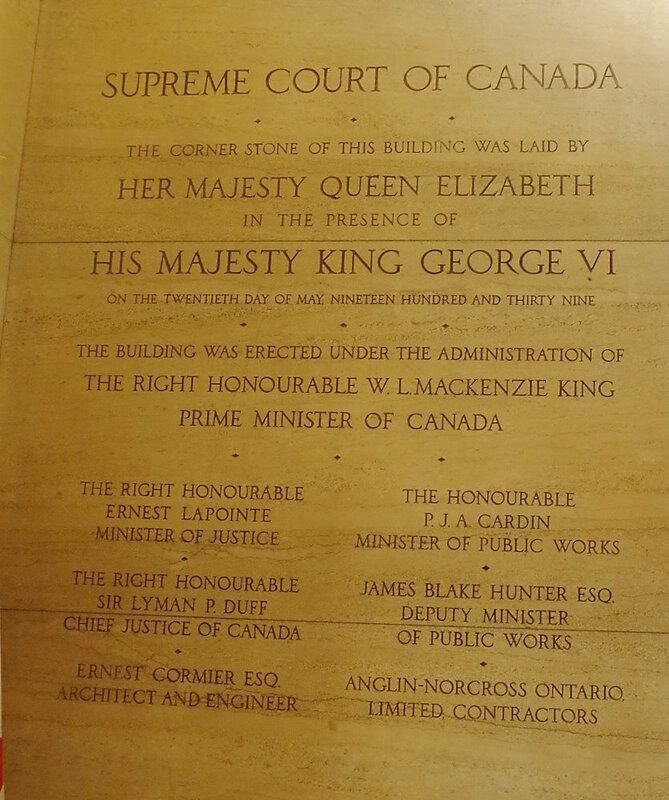 The cornerstone was laid by Queen Elizabeth, the queen’s mother on May 20, 1939. 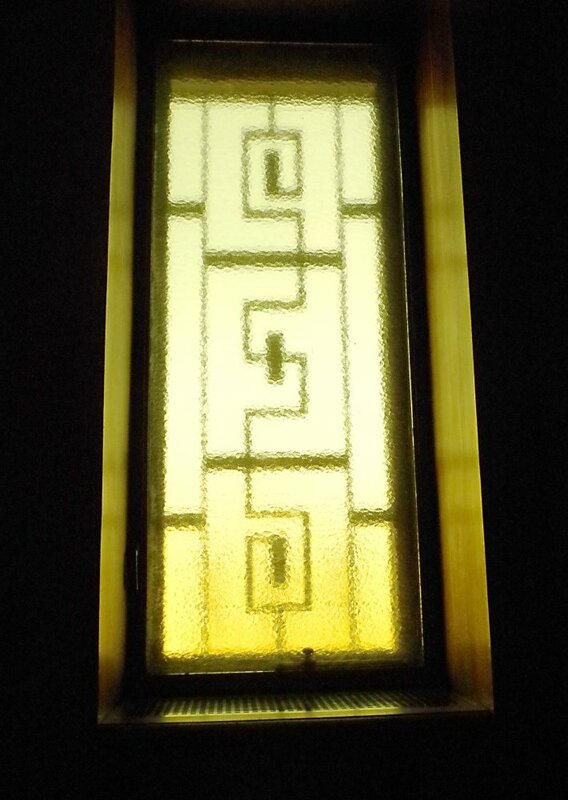 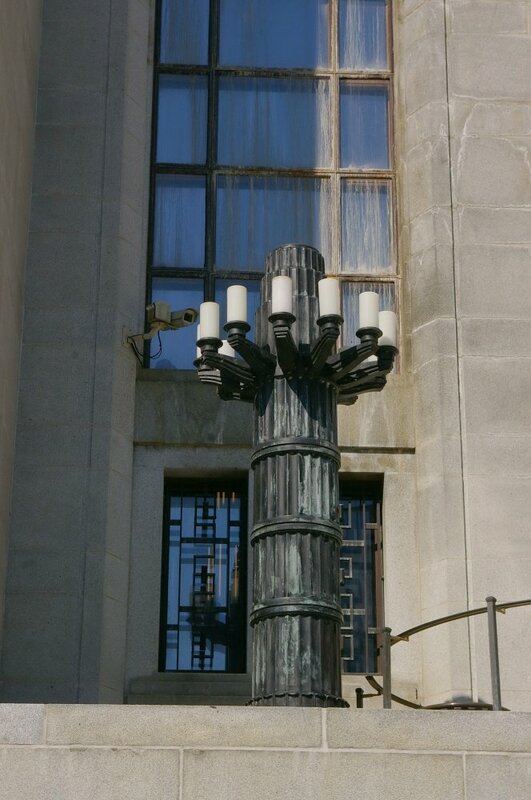 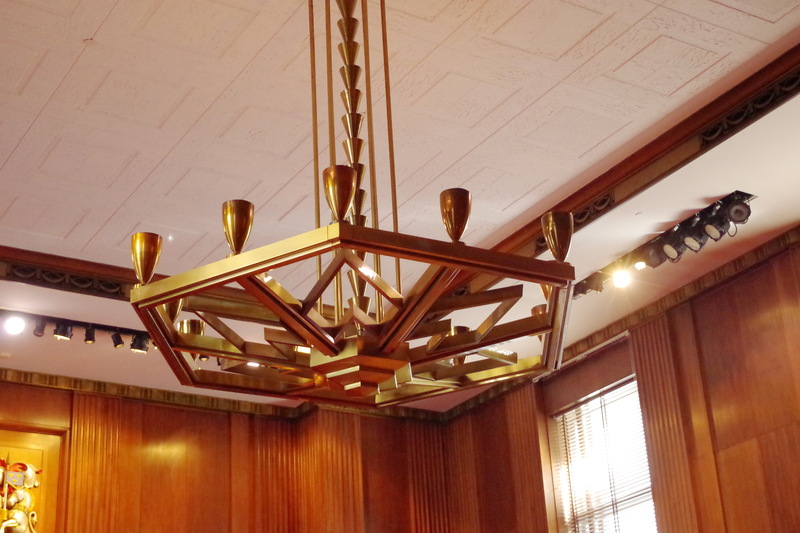 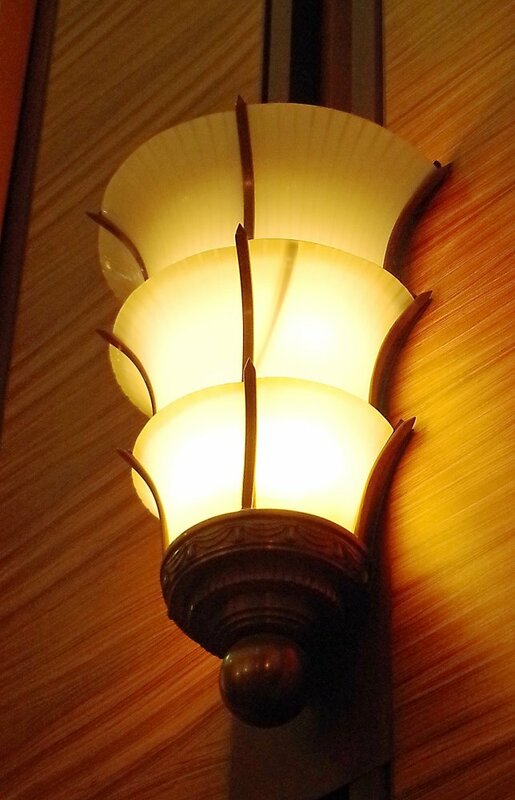 At the entrance to the building are two fluted metalic torch-like pillars with clusters of lighting brackets at the top. 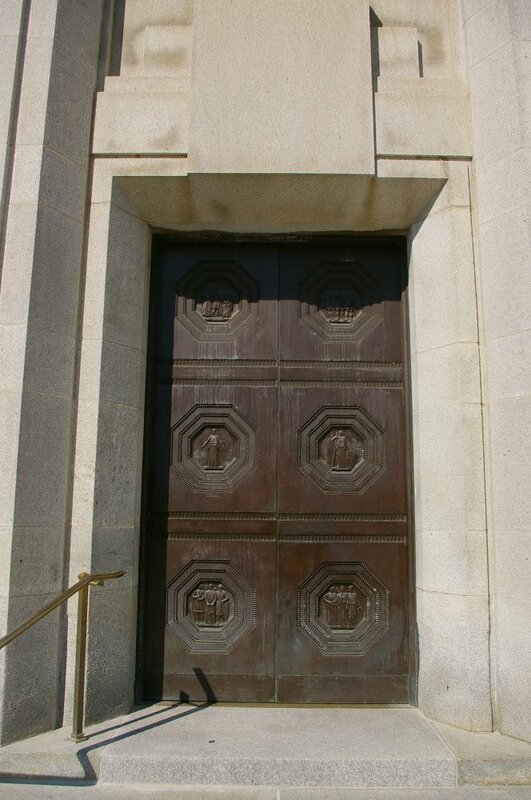 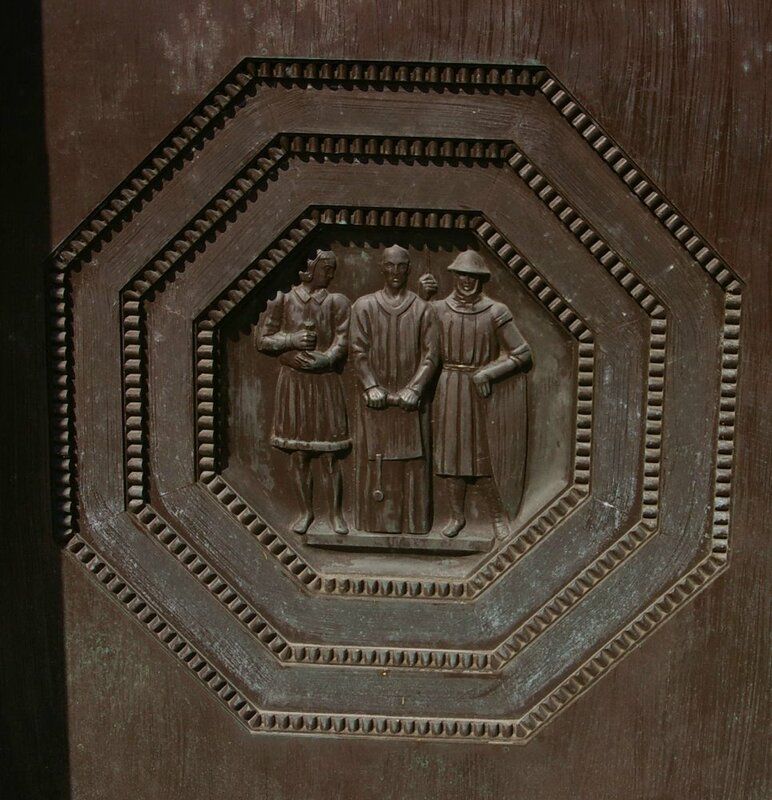 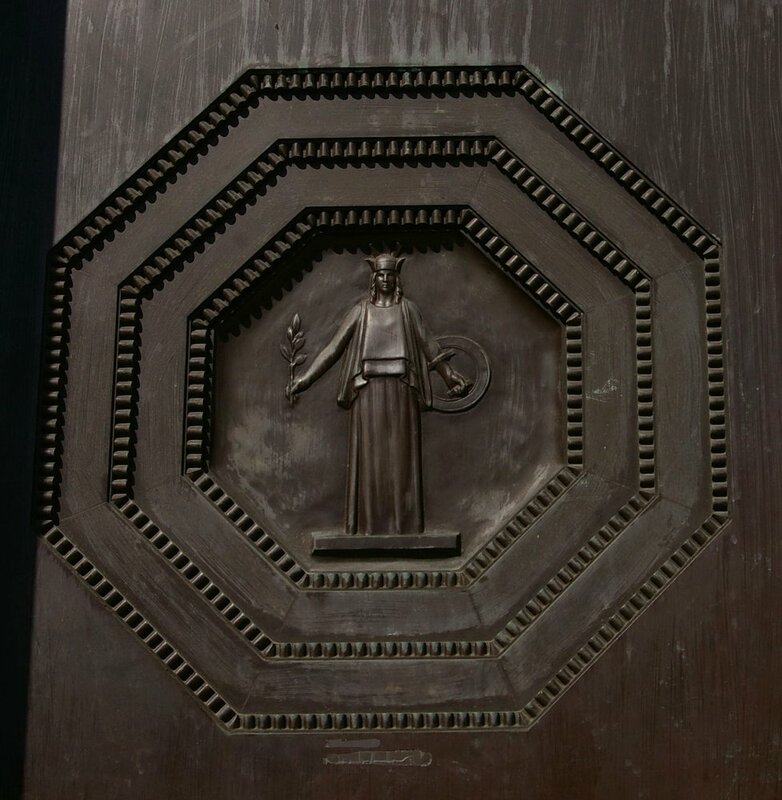 Two bronze doors give access to an impressive Grand Entrance Hall measuring 32 metres by 17 metres and 12 metres in height. 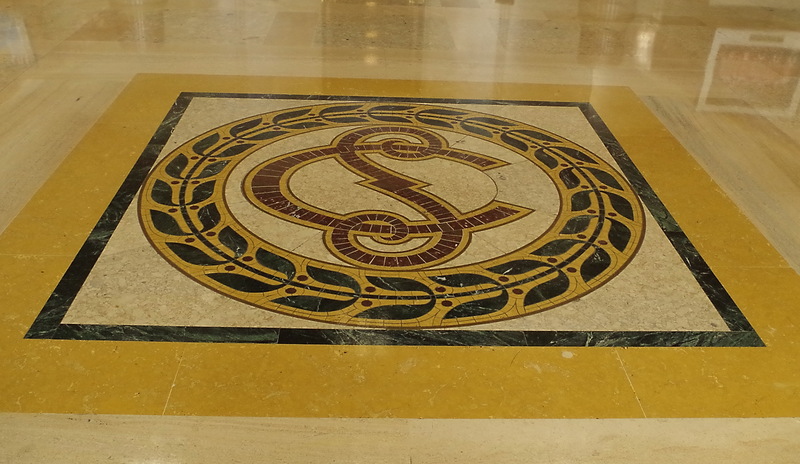 The walls are rubane marble and the floor Verdello and Montanello marble. 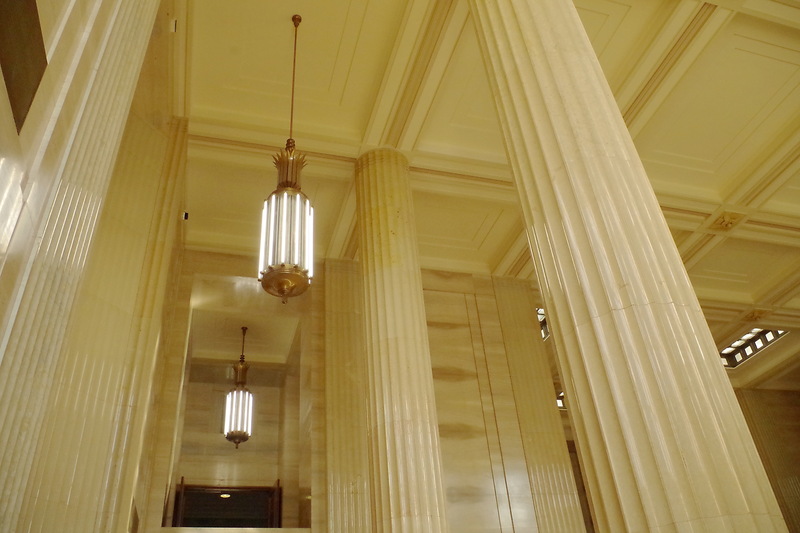 Four marble like columns along the end walls support a deep coffered ceiling. 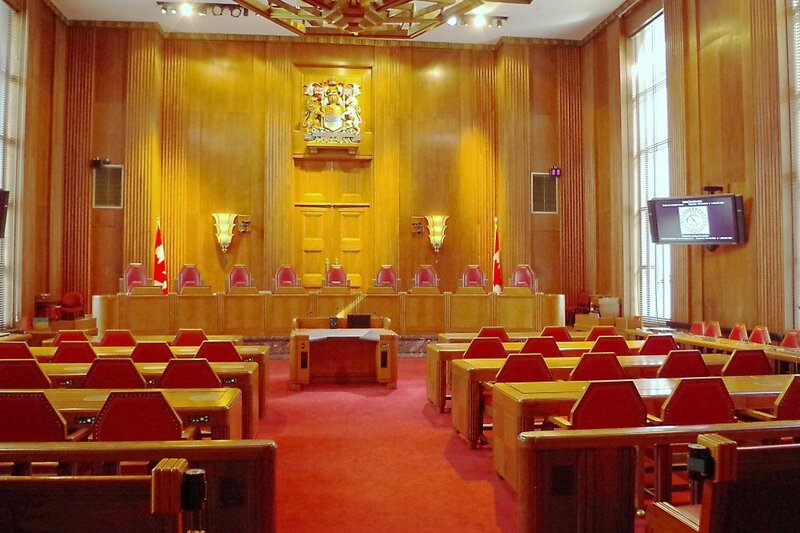 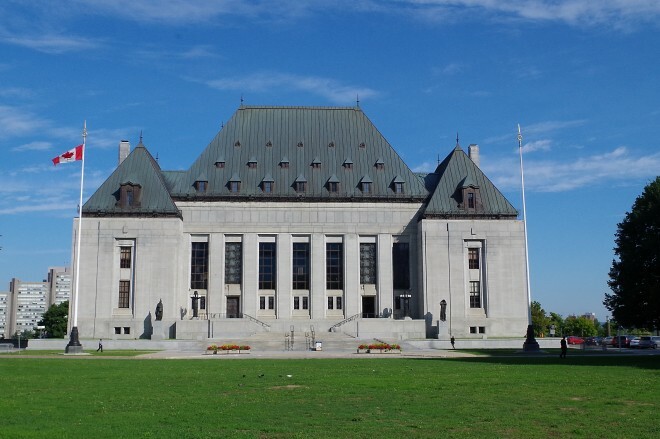 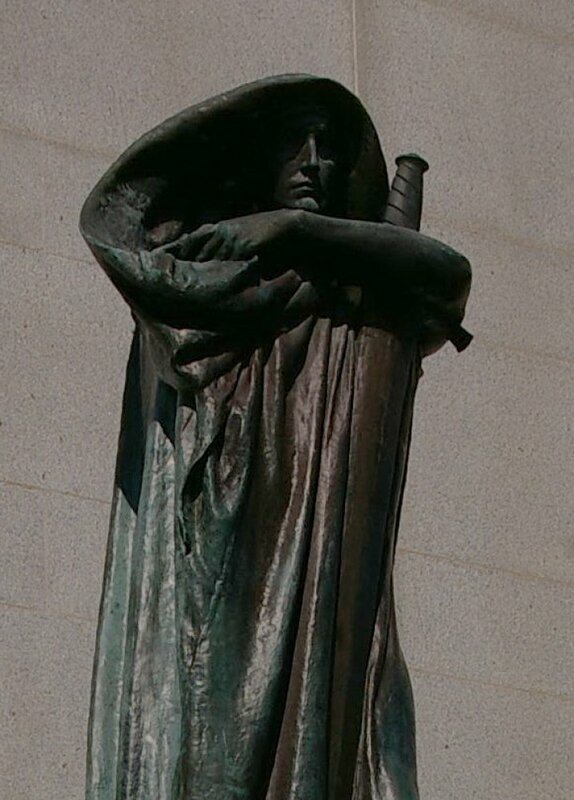 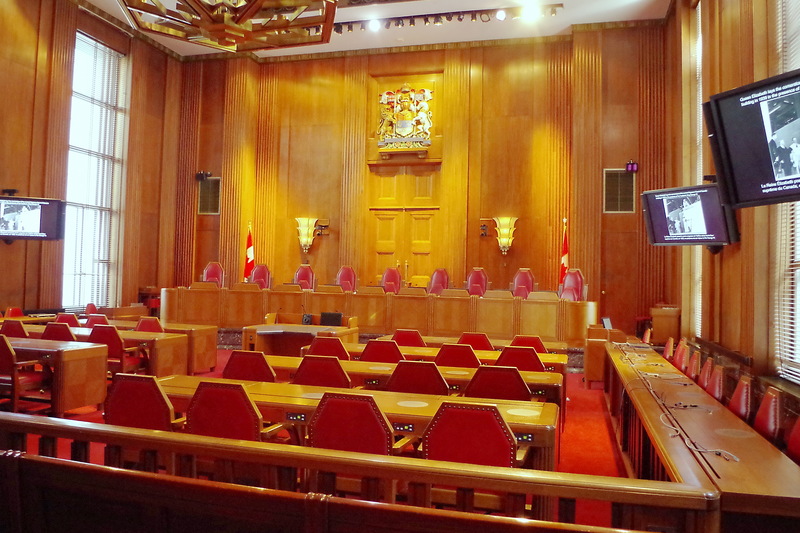 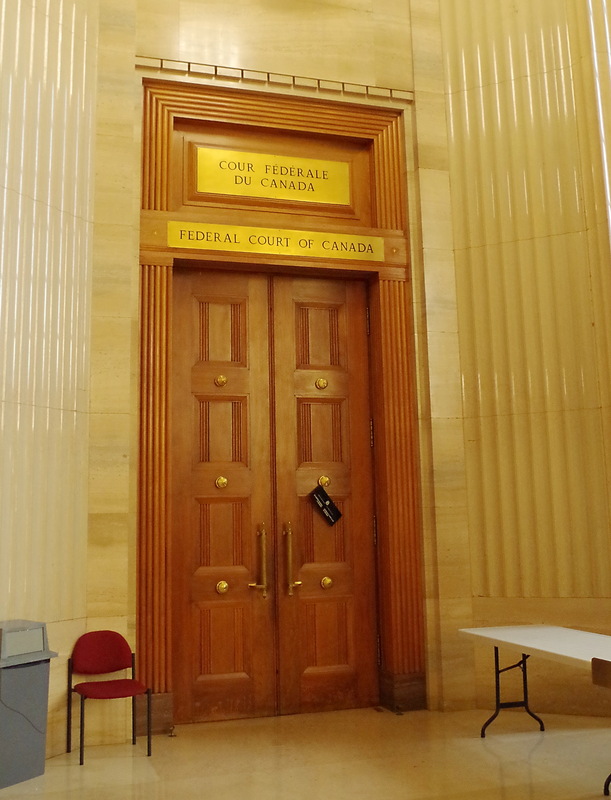 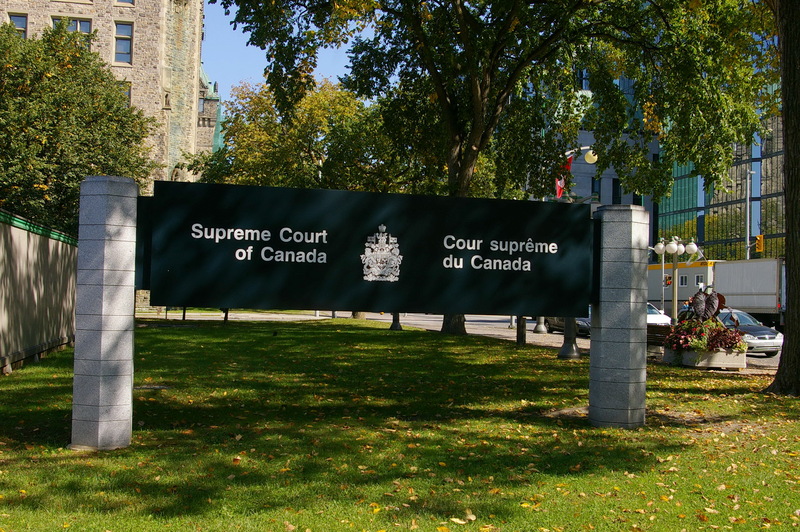 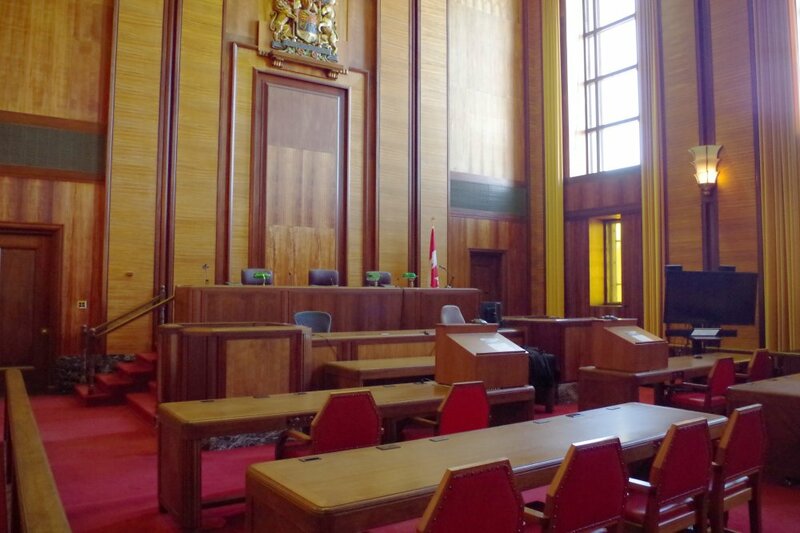 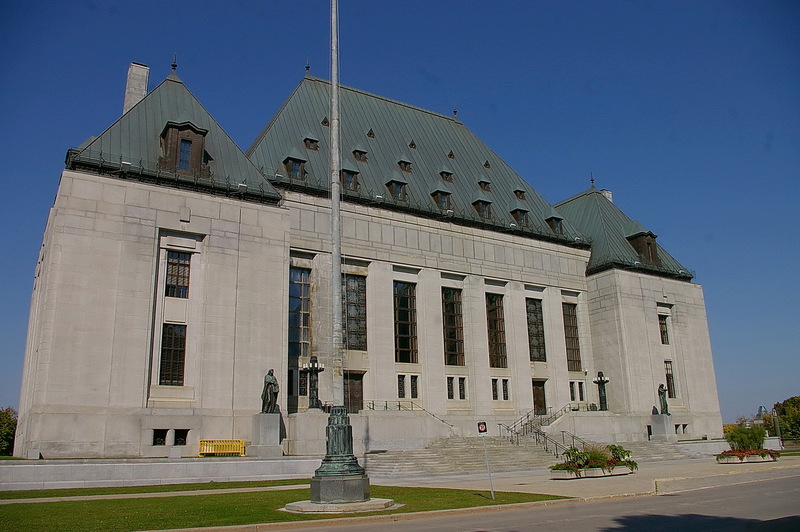 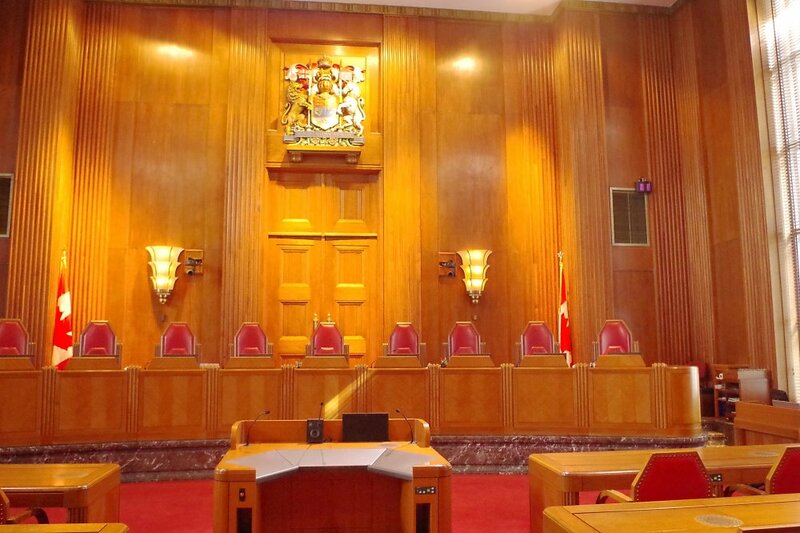 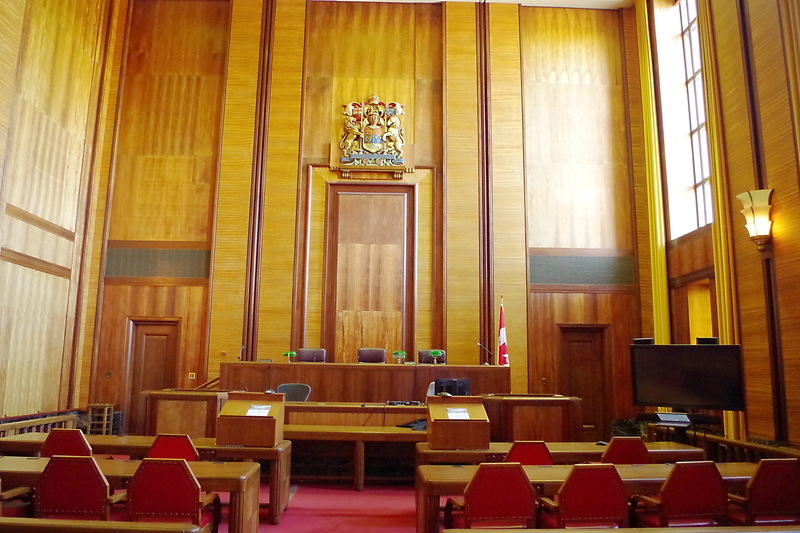 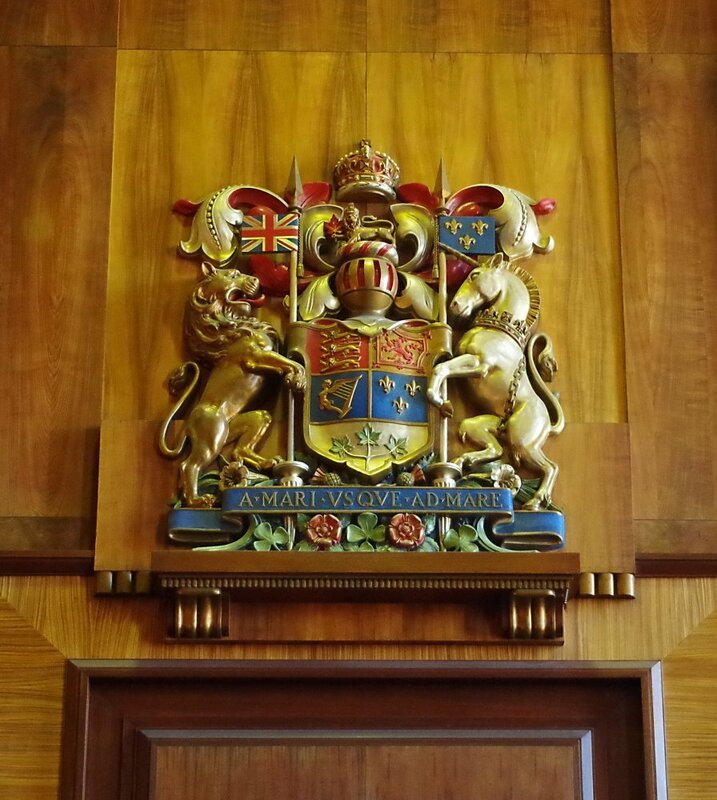 At each end of the Grand Entrance Hall is a courtroom used by the Federal Court of Canada. 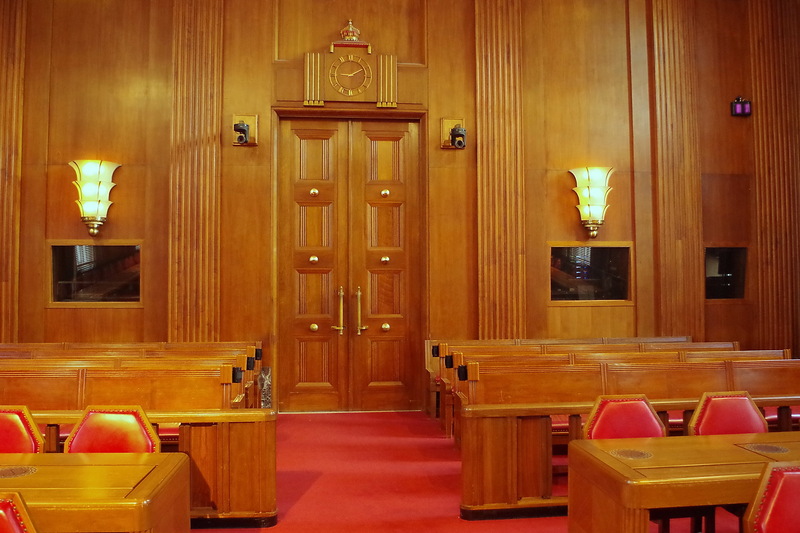 The walls of these two courtrooms are walnut paneled with Australian zebrano wood pilasters trimmed with Honduras mahogany. 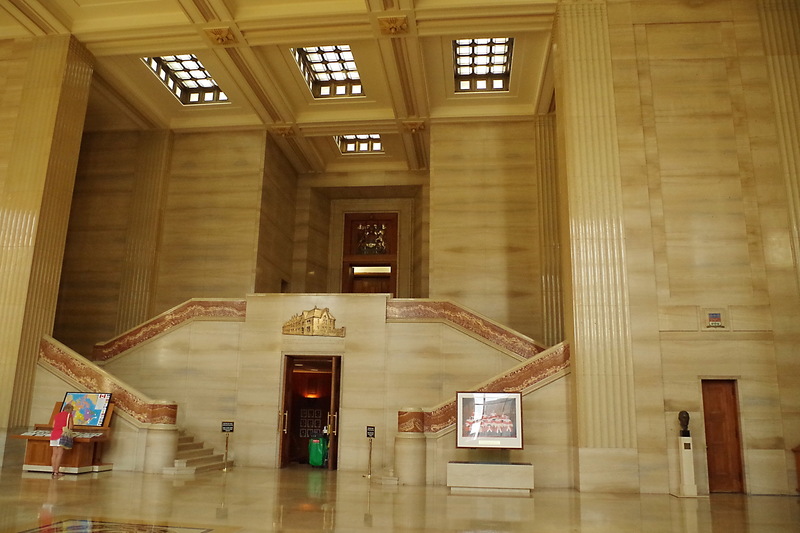 Corridors, with Missisquoi marble floors and walls, encircle the building on the ground floor and on the first and second floors. 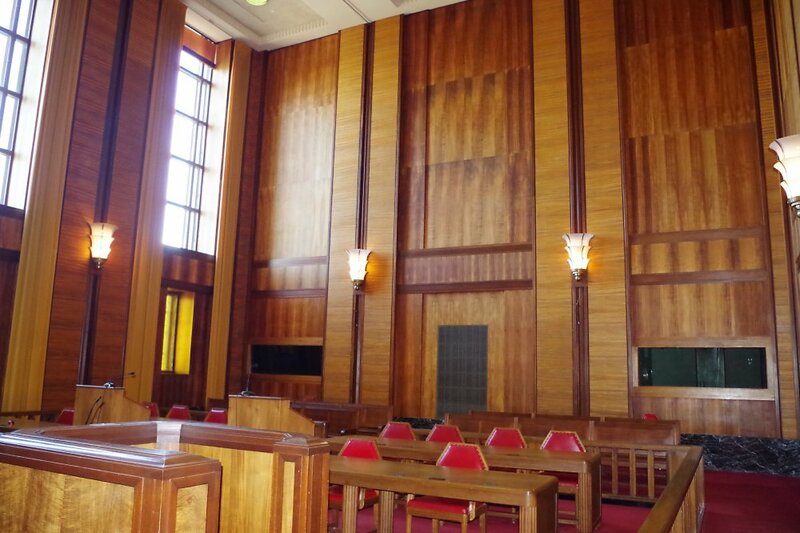 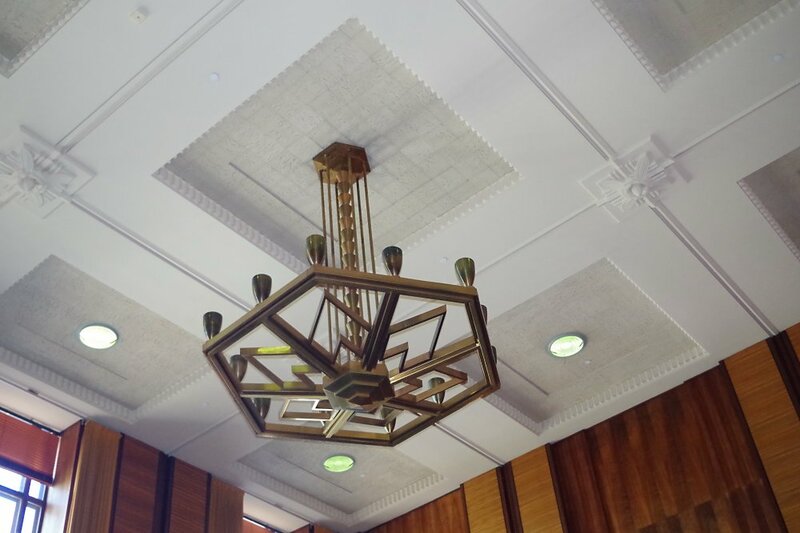 The Supreme Court Chamber is located on the first floor in the centre of the building. 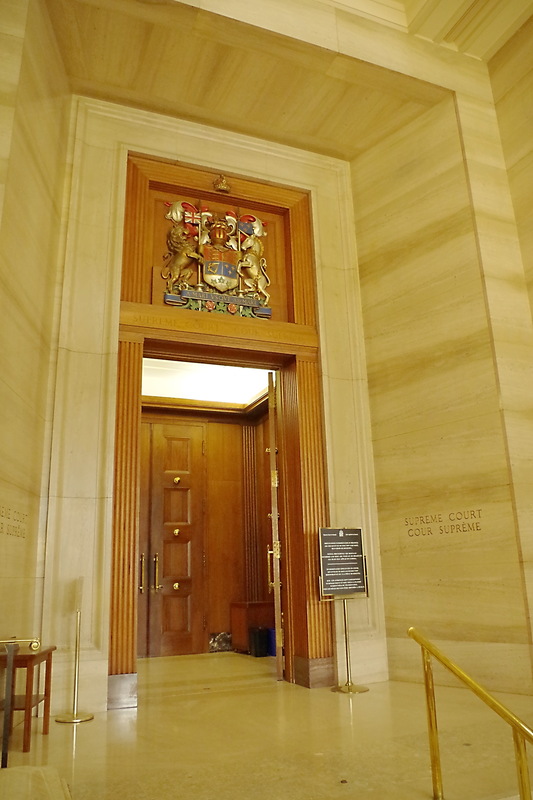 A flight of stairs leads up from the Grand Entrance Hall, The Chamber has windows on the east and west with the court bench at the north end of the wood paneled room.. 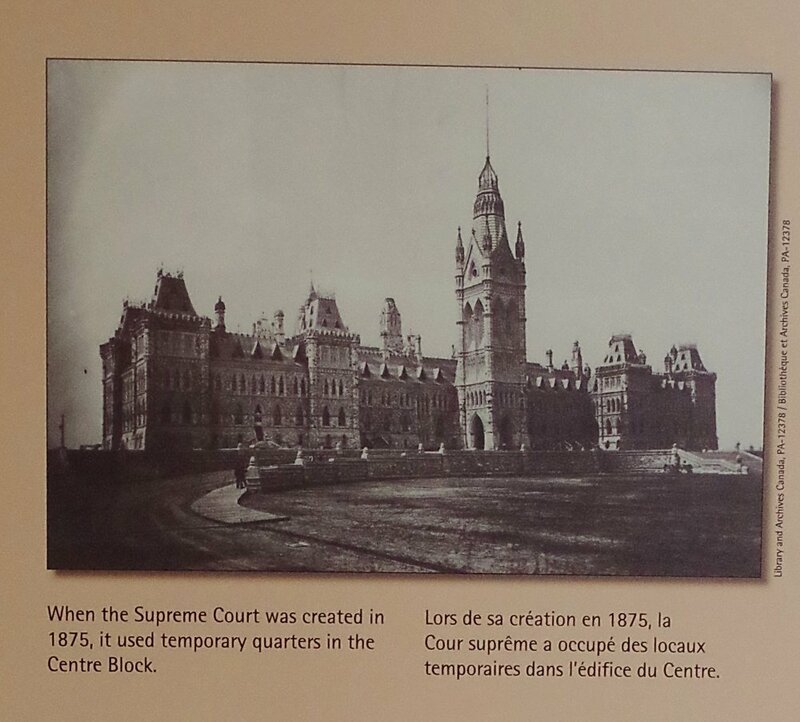 Note: The Supreme Court was created in 1875 and first met in 1876 in the Railway Committee Room and other rooms in the Parliament Building. 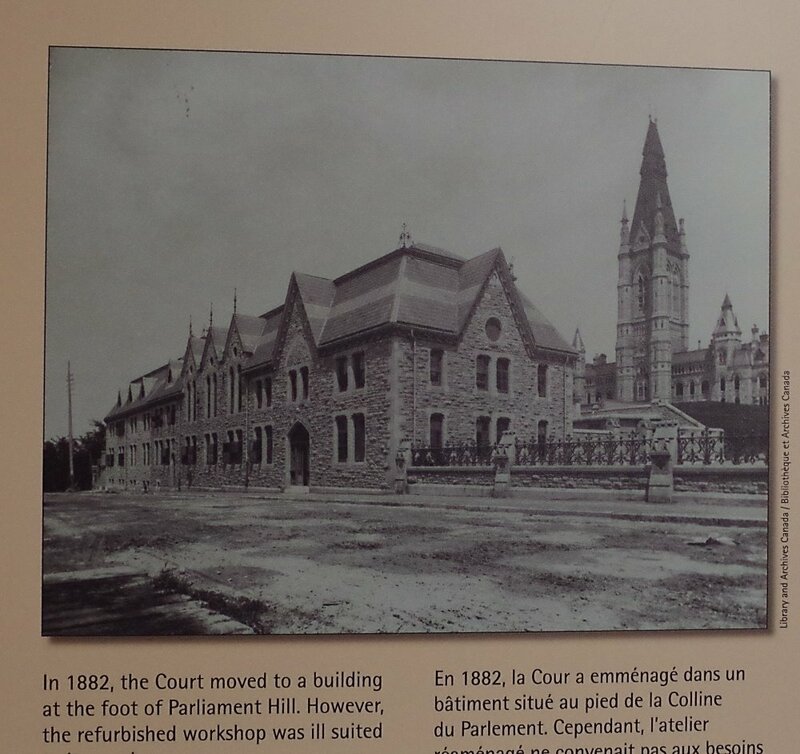 In 1882, the court moved to a building on the grounds of Parliament in 1882. 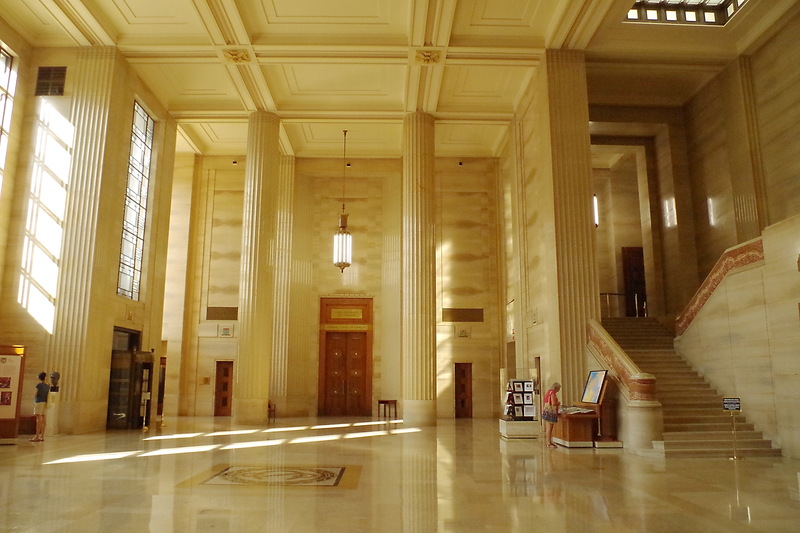 In 1940, the court moved into its present building.